Selling off some rare records from my collection. 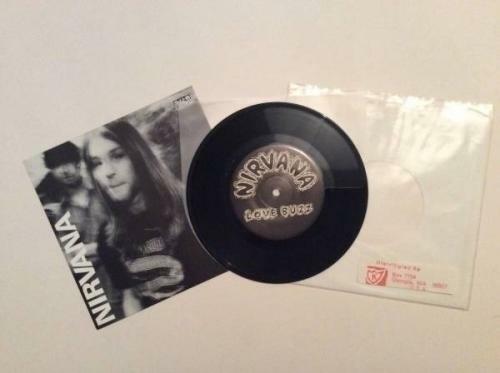 This is the legendary original 1st Nirvana release, limited and hand numbered. Much sought after. This comes with an original 'K records' USA stickered sleeve (sticker is a bit loose). Hallmarks of original status - 'k-disc' stamp, 'why don't you trade those guitars for shovels?' on runout, writing on back sleeve fully legible. See pictures. Vinyl - one faint long hairline on a-side, visable under strong light, one other faint tiny hairline. Few other faint tiny hairlines on b-side. Overall near mint minus to excellent plus. Sleeve - fold out and numbered, few tiny bits or corner wear, small bit of creasing, see photos. Tiny mark on right hand side rear border. Overall excellent plus. Original plain paper inner sleeve has a ~2cm RIP from centre. Can provide additional photos on request. In my opinion this is in great condition, have been very happy to have it as one my most absolutely most prized records in my collection over the years. I package record outside sleeve, both in protective covers, in sturdy cruciform mailers. Will be sent as quickly and securely as possible. See my other items for sale.